Air Canada opened a new Maple Leaf lounge on September 14th, 2018 in Saskatoon (YXE). 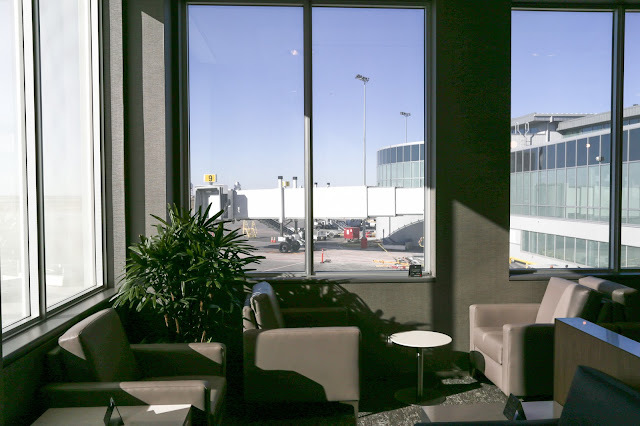 The lounge is a welcome addition to the airport and it is nice to see Air Canada expanding the number of lounges. This brings the total of lounges in Canada to 17. The lounge is located across from Gate 5, next to Tim Hortons. It is well marked with strong signage showing its location and is easy to find. The entrance is lined with a very simply designed wood panelling, which extends from the gate area down the hall and into the reception area of the lounge. The Air Canada logo is displayed prominently on the wall behind the desk. The front of the desk has a very cool covering consisting of 100’s of maple leaves in an overlapping pattern. It is quite exquisite and adds a touch of class to the entrance area. This 1,475 square foot lounge is long, but very open. The seating total seating capacity of the lounge is 40. It has large windows which surround the entire seating area allowing in lots of natural light. These windows face the tarmac which gives you the opportunity to do some aircraft watching if desired. It has high ceilings which also accentuate the open feeling in the lounge. The décor is in various shades of brown and very nicely done. Lighting is strong, but not overpowering. The atmosphere is very relaxing, with soft music in the background. Not loud enough to be disruptive; it is still very easy to carry on a conversation. There is one television located at the far end of the lounge. It was tuned to the news and quite conveniently had the closed captioning activated so you would be able to follow along from anywhere in the lounge. A Flight Departures screen is located at the front of the lounge enabling you to check on your flight status. Two computers are available for guest use along with a counter area to utilize your personal computers with seating for 10 (included in total seating capacity number). You are also able to print documents with the lounge printer if needed, both in black & white and colour. Wi-Fi is available and is very easy to connect to. Just opening your browser takes you to the sign in page and you are on line instantly. I found the signal strength to be very strong and had no issues with speed. Washrooms are located outside the lounge, but conveniently placed right next to it on the left as you exit. 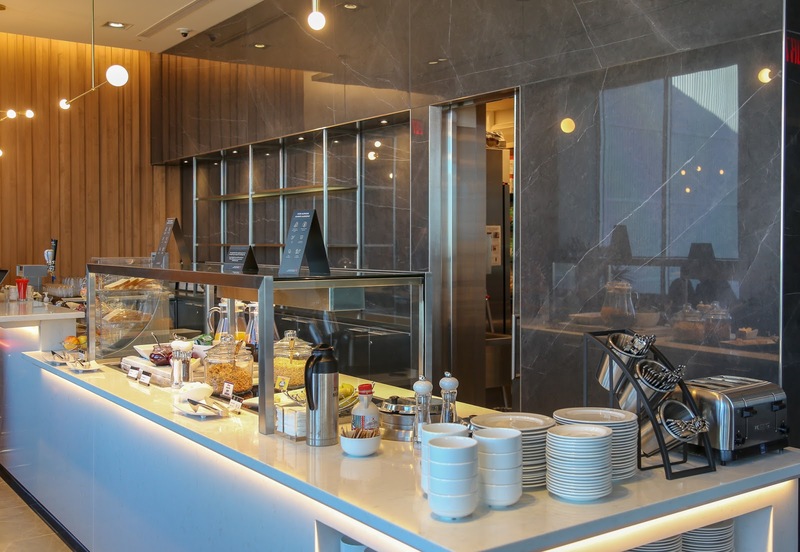 The food offerings are consistent with other Maple Leaf lounges. 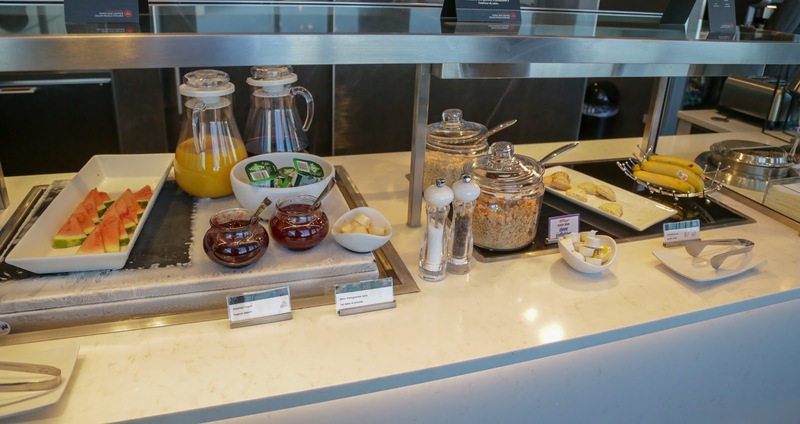 For breakfast they have assorted fruits, scones, cereal, oatmeal, toast along with a choice of juice. Lunch consisted of 2 salads (Maple Broccoli, String Pea & Herb Orzo) along with Salted Edamame Beans. Chocolate Chip and Oatmeal cookies were available all day. Cucumber and Citrus infused water is also offered. 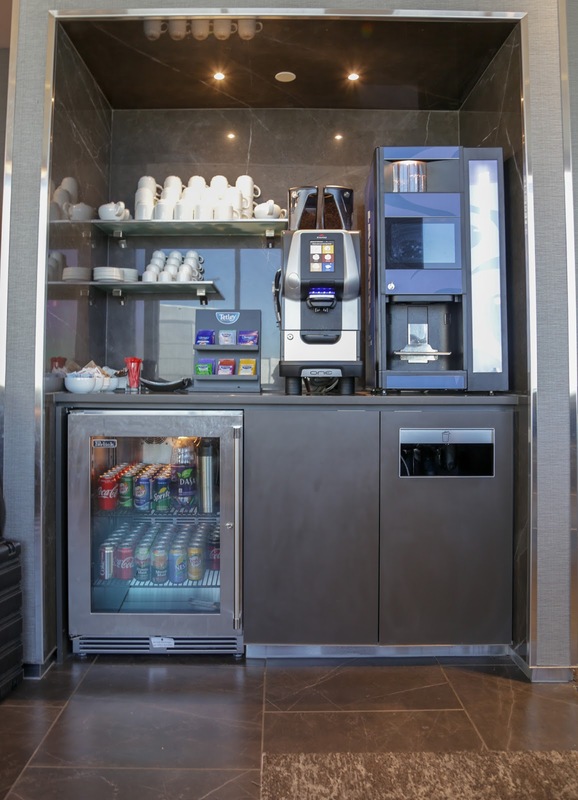 There is an Expresso machine (self-serve) that offers all manners of coffee drinks. Various assorted teas are available as well as a full selection of soft drinks. The bar area is full-serve with a good assortment of wine & Spirits. There are also 3 beers on tap; Molson Canadian, Coors Light & Guinness. (One thing that I did find interesting was a sign on the front of the beer taps indicating that gratuities were not necessary). I believe they are going for a minimalist and uncluttered/streamlined appearance at the back of the bar area, but I just can’t help thinking that there is something missing. There is a lot of shelving to fill, but it seems to be quite bare. In fact, during the morning, there is absolutely nothing on the shelves at all, the bottles have all been removed and put away. The staff are very friendly, attentive and personable. You are greeted warmly at the door and made to feel welcome as soon as you arrive. Staffing was at an acceptable level with all guests being well looked after. The team was very much out in the lounge (not just standing behind the food & drink area); they were even offering to freshen up drinks for people who were already seated. A very nice touch and speaks well of the customer service level and demonstrates a guest first philosophy in this lounge. The lounge was approximately half-full during my visits, but it still felt very comfortable and relaxing. All in all, I would recommend this lounge for anyone flying through YXE. It is quiet, very comfortable and a great place to relax before taking to the skies once more.